I have an i7-4930MX 3.2 with AVX2 – Ran the rest for you with the following results. 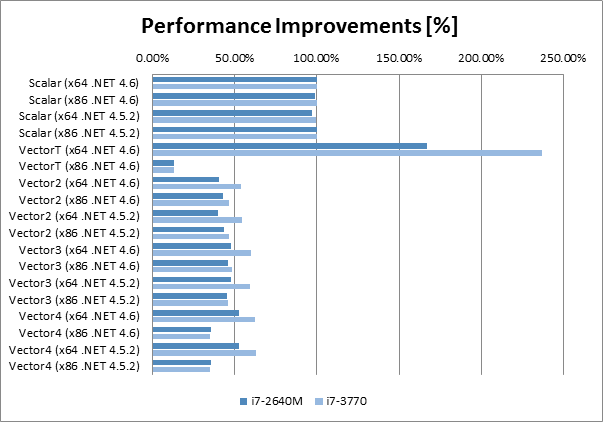 Quite interesting, and shocking that the x86 with VectorT is so bad. Run 4 Run 5 Avg. I have an Intel i7-4930MX with AVX2 on it (extreme mobile processor). Not sure it made much of a difference (not sure how clock rate impacts the tests vs your results though). x86 VectorT is crazy slow on these tests. That was a bit shocking.